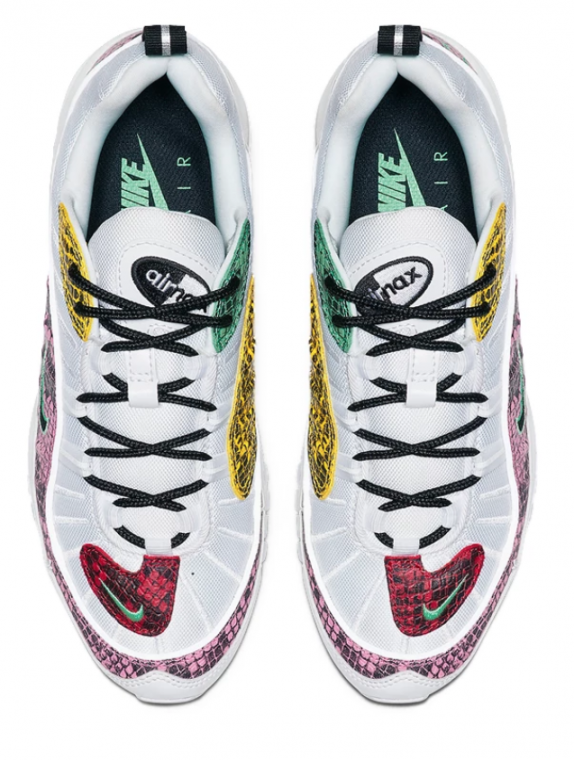 Nike has been doing the most with its recent multicoloured, multi-textured releases of its widely popular Air Max 98 silhouette. We’ve seen it drenched in animal print, it’s been given a festive pony hair makeover for Chinese New Year, and it’s even been taken back to the denim and bandana-wearing cowboys of the Wild West. 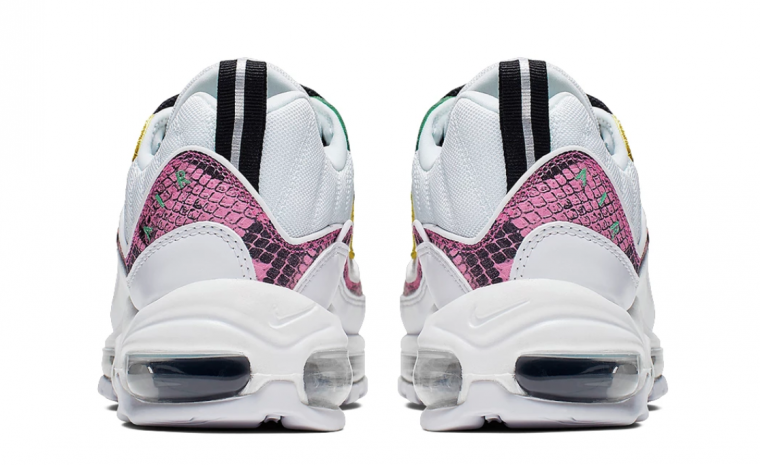 This time around Nike has gone animal print mad with snake print women’s exclusive. 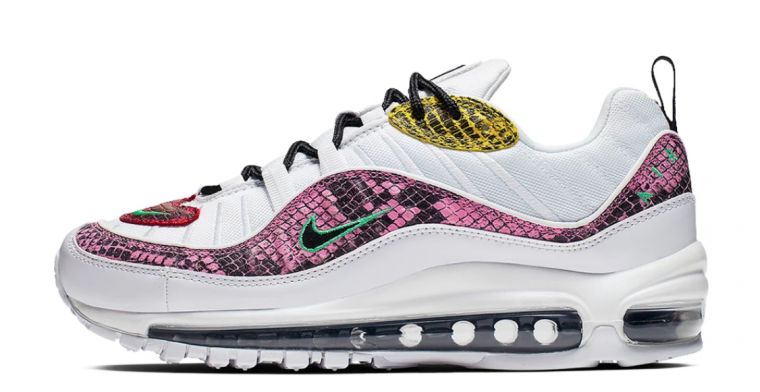 Based on a ‘lab white’ silhouette, the 98 has been decorated with colourful contrasting snake print patches in pink, red, yellow and green. With the neon trend still a firm favourite among fashionistas, this allows you to incorporate some fluorescent hues without going full highlighter. Small embroidered mini Swooshes appear midfoot on the sidewall as well as at the toe vamp, while ‘Air’ is embroidered at the back on the heel in green. Black round laces contrast with the white silhouette and there’s also a black and white Air Max logo embroidered at the top of the tongue. Of course, no 98s would be complete without a full length transparent Air Max cushioning unit, keeping your feet happy and comfy with every step. When you’re dealing with animal print, it’s either go bold or go home. Go head to toe snake print or keep it strictly on your feet. Either way, this is a women’s only release not to be missed! 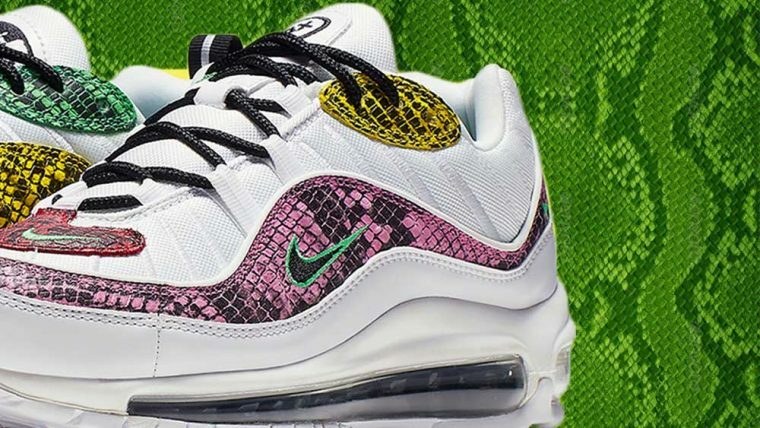 Keep it locked to The Sole Womens for more info on when the Nike Air Max 98 in Snake Print is released and for all the latest sneaker news!